A well-maintained steam boiler requires regular blowdown events to eject the impurities left behind when the water carrying them transforms to steam. 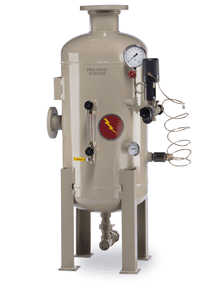 Precision’s blowdown tanks are designed and fabricated to comply with exacting industry standards to reduce the pressure and temperature of blowdown boiler water before discharge to the facility drain. Most local and state regulations require boiler blowdown water temperature less than 140oF before it can enter the main drain system. 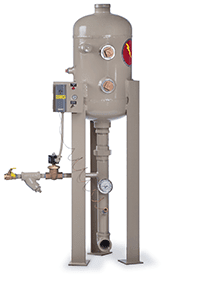 Our blowdown tanks and separators are available in a variety of sizes to fit any specification and can be configured for heat recovery to preheat boiler feedwater.